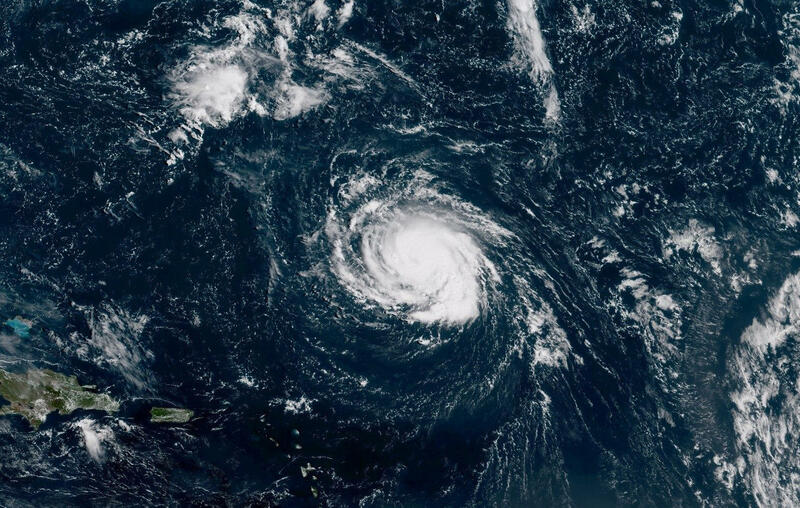 Hurricane Florence strengthened Sunday as it moved across the Atlantic toward a possible direct hit on the U.S. Southeast by the end of the week. The storm prompted warnings for residents up and down the coast to get their emergency kits ready, map out escape routes and fill sandbags. The National Hurricane Center (NHC) cites aircraft data that indicates Florence's maximum sustained winds have increased to near 90 mph. The center of the storm is moving at about 7 mph and is located about 685 miles southeast of Bermuda and about 560 miles northeast of the northern Leeward Islands, according to the 11 p.m. ET advisory from the NHC. Drawing energy from the warm water, it could be a fearsome Category 4 with winds of 130 mph or more by Tuesday, the hurricane center said. "Pretend, assume, presume that a major hurricane is going to hit right smack dab in the middle of South Carolina and is going to go way inshore," South Carolina Gov. Henry McMaster said in a news conference Sunday. The state's emergency management agency said it is "preparing for the possibility of a large-scale disaster." Officials in Charleston offered sandbags to residents. Myrtle Beach Mayor Brenda Bethune urged people to secure their homes but said it's too early to know if evacuations will be ordered. In Jacksonville, North Carolina, about 20 miles from the coast, some residents picked up hurricane supplies during their normal weekend shopping, The Daily News reports. Ilija Cesal told the publication he wouldn't worry about buying extra water or other supplies for a few more days. The Navy planned to send ships from the Hampton Roads area of Virginia out to sea. Florida-based Carnival Cruise Line re-routed its cruise ships. The governors of North and South Carolina and Virginia declared states of emergency far ahead of the storm to get ready.